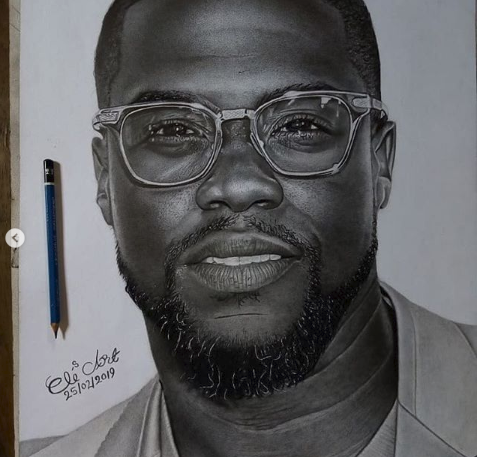 Barely two days after Nigerian artist, Eli Waduba Yusuf tweeted a hyperrealism portrait of Kevin Hart, he has not only gotten the attention of the comedian but has also been commissioned to make more portraits. Following over 21k retweets of the drawing and tags, a ‘wowed’ Hart tweeted back at a user, describing the artwork as an expression of “talent out of this world”. He later went on to tweet directly at the talented artist saying, “I see it and I want to purchase it. “I also want to support you and your amazing talent by giving you a fee to do a pencil drawing of 3 of my celebrity friends that I can gift it to. “DM your info and let’s get to work”. 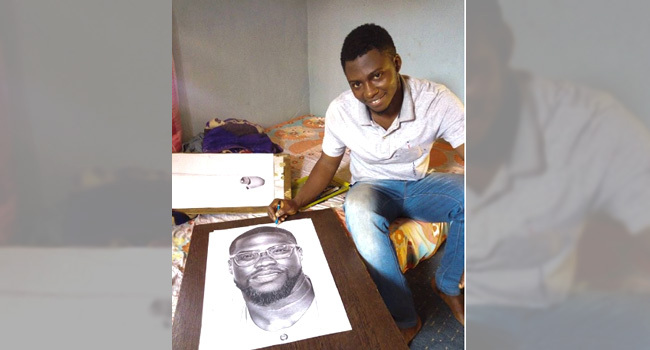 26-year-old Yusuf had spent two weeks drawing the detailed pencil image of Hart that looks like a black and white photo. With his dreams coming through, fans of his work across social media have been congratulating him and wishing him well. Yusuf, on the other hand, has continued to thank fans for spreading the word and making his dreams possible.